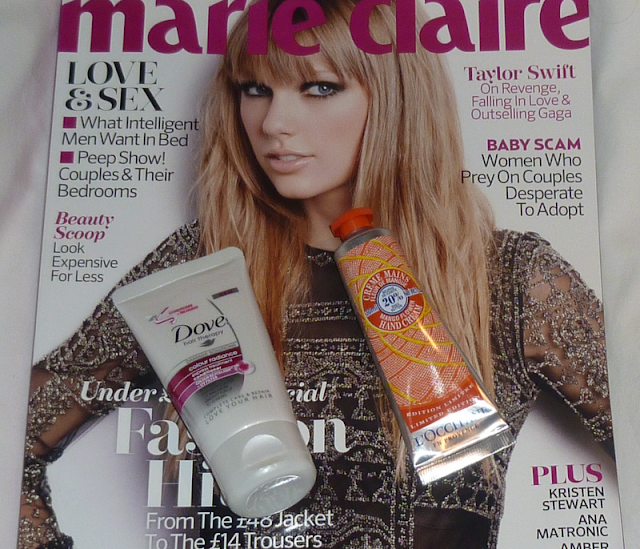 With this month's Marie Claire magazine you get a free 30ml L'occitane Hand Cream. You can choose from 4 different kinds - regular Shea Butter or one of the limited edition Shea Butters in Rose Petals, Mango Flower or Date Bouquet. I went for Mango Flower as I love mango so hopefully it will be nice. I really like L'occitane hand creams as they are super moisturising but don't leave your hands greasy. You also get a second free gift this month in the form of a travel size bottle of Dove Colour Radiance Express Treatment. I'm looking forward to trying this as I bought the Intensive Repair version as part of last weekend's haul and I'm enjoying using it. The magazine is £3.70 so it's worth it for the hand cream alone. I'm sure I'll enjoy reading the magazine too though. Which hand cream would you prefer? Have you picked up this great freebie?